The ICD-10 codes are very different from the ICD-9 codes. There are many more codes because each diagnosis has numerous “modifiers”, also referred to as additional digits, to differentiate the nuances in each condition. For example, the code E10.__ has been defined as Type 1 diabetes mellitus, but we now have a list of 10 modifiers to further identify the diagnosis of diabetes mellitus. E10.2, for example, is the diagnosis for “Type 1 diabetes mellitus with kidney complications”. 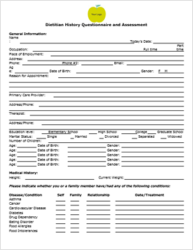 This super-bill will list the diagnoses most likely to have nutrition implications, with a blank after the dot for the clinician to fill in the modifiers and in some cases a blank after the code to write in the specific diagnosis. 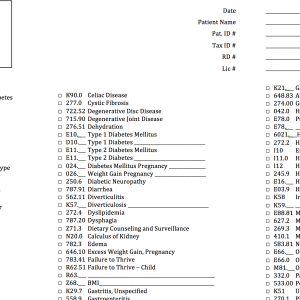 Due to the sheer number of ICD-10 codes, it is not possible to fit them all on one page. Note it is not within the scope of practice for a registered dietitian/nutritionist (RDN) to make a medical diagnosis. 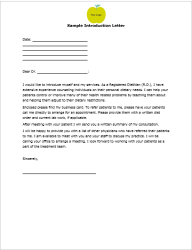 The one exception is the BMI codes, as “they represent a mathematical calculation based on measurements that are within the RDNs scope of practice to perform.” (1) RDNs should obtain the additional digits from the physician/physician assistance office to accurately complete the super-bill.